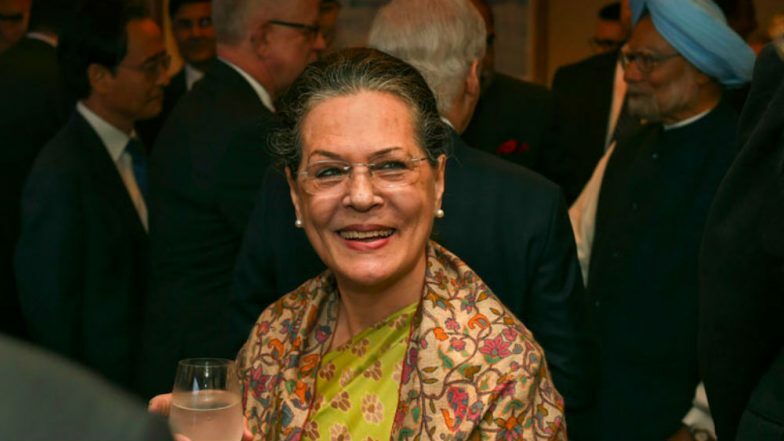 New Delhi, April 12: The net worth of Sonia Gandhi, the United Progressive Alliance (UPA) Chairperson, has gone up by 21% in the last five years, her affidavit filed with the Election Commission revealed. Sonia’s net worth touched Rs 11.82 crore in 2019 against Rs 9.28 crore during the 2014 Lok Sabha poll. On Thursday, Sonia filed her affidavit before Raebareli District Magistrate in the run up to the upcoming polls in Uttar Pradesh. As per the affidavit filed by Gandhi during submitting her nomination, she only has Rs 60,000 in cash and fixed deposits to the tune of Rs 16.59 lakh. Hema Malini Has A Net Worth of Rs 101 Crore. The UPA chairperson has also declared ownership of agricultural land in Deramandi and Sultanpur Mehruli villages in New Delhi valued at Rs 7.29 crore. She also has a share in a property inheritance in Italy valued at Rs 7.52 crore. Moreover, her affidavit stated that she has taken a personal loan of Rs 5 lakh from her son and Congress President Rahul Gandhi. Uttar Pradesh Lok Sabha Elections 2019 Schedule: Constituency Wise Dates Of Voting And Results For UP General Elections. The affidavit states that she has invested a total of Rs 2,44,96,405 in shares, including in Reliance Hybrid Bond G, and has tax-free bonds worth Rs 28,533. Apart from these investments, Gandhi has also disclosed investments worth Rs 72,25,414 in postal savings, insurance policies and National Savings Scheme (NSS). Sonia Gandhi filed her nomination papers from Rae Bareli in Uttar Pradesh on Thursday and declared that Prime Minister Narendra Modi was not invincible. The UPA chairperson is trying to retain the Raebareli seat for the fifth time. She had won the seat in 2004, 2006 (by-polls), 2009 and 2014. The Raebareli seat has been held mostly by members of the Nehru-Gandhi family including Feroze Gandhi, Indira Gandhi, Arun Nehru and Sheila Kaul in the past. Amit Shah Has Net Worth of Rs 53.9 Lakh. Rae Bareli will vote in the fifth-phase on May 6 and will see a straight contest between Sonia Gandhi and Dinesh Pratap Singh, who recently joined the BJP after leaving the Congress. Meanwhile, the Samajwadi Party and the Bahujan Samaj Party (BSP) have not fielded any candidate in this Congress bastion. In the last elections held in 2014, there were 15.94 lakh voters in the constituency and the poll percentage was 51.73 per cent, in which Sonia Gandhi had got 5,26,434 votes.